River District, located at 8683 Kerr Street, will be hosting a farmers market every Saturday starting May 3rd from 10:00 am – 3:00 pm. For those new to this market, this is generally a smaller market compared to the markets held at Trout Lake and Nat Bailey Stadium. You can expect to find many local products at the market including produce, plants, baked goods, handmade goods, works by local artisans, live music, coffee and you will often find activities for the kids. The market is located at the foot of Kerr Street, one block South of SE Marine Drive and is easily accessible by car, bike or transit. The market will run every Saturday until October 18th. 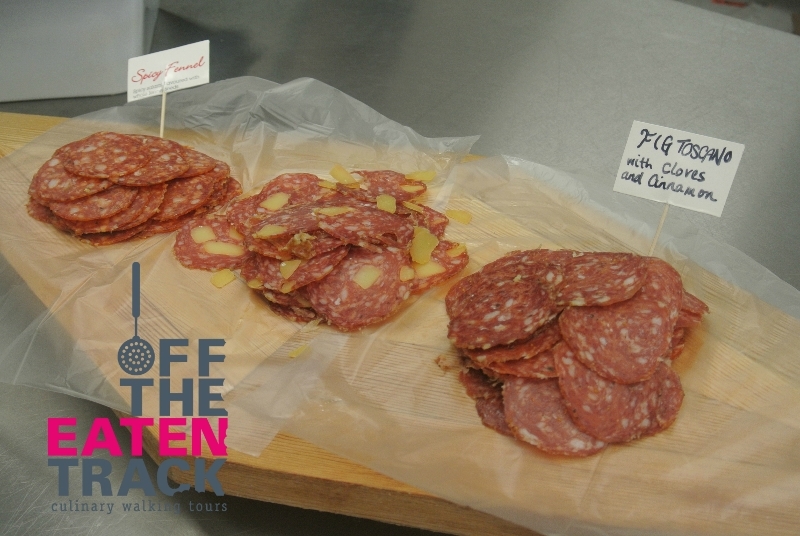 The ladies at Off The Eaten Track Tours have just announced a new culinary tour. It is Vancouver’s Best Brunch Tour in the heart of the East Village in the area off East Hastings & Nanaimo. You are invited to join them on Saturday mornings from 10:00 am to 12:30 pm to learn a bit of history about East Vancouver, meet some local businesses and nosh your way through a progressive brunch. The tour starts at the funky East Café for a homemade egg frittata with salsa. This café serves up delicious light meals and pastries by two passionate locals. Your next stop is the family-run Saltenas for a delicious Bolivian pastry. While there, be sure to ask when their next night of live Spanish music will be. Next up, you will sample a “mind-blowing” Caesar cocktail from the very new and eclectic Jackalope’s Neighbourhood Dive. Then you are off to a local butcher shop for a delicious sausage tasting. This spot makes all of their sausages in house and uses the best local and free range products. All that eating, will make you thirsty, so your last stop will be a tour of Vancouver’s smallest tea shop for a tea tasting. You will learn about single origin and estate teas from around the world. Sounds like a great way to spend a Saturday morning. The cost of Vancouver’s Best Brunch Tour is $65 which includes food, beverages and private van transportation to and from the downtown pick-up location at Waterfront Station, 601 West Cordova Street. Tours start at 10:00 am and runs for 2 ½ hours. To book your tour, visit Off The Eaten Track. The BC SPCA recently polled its members to see what members, like myself, would like to see the BC SPCA focus on going forward. The answer was preventing animal abuse. They are asking each and every one of you to take action to help animals. If are concerned that an animal may be in distress, please do not ignore it. A simple call could save the life of an animal and prevent unnecessary suffering. Animal Abuse Prevention Day has been observed since 2011 after a private citizen requested a provincial proclamation as a memorial to 56 sled dogs in Whistler, B.C., who lost their lives on April 23, 2010. That proclamation has been observed by the provincial government each year since, making this year the fourth annual event. * Don’t be a bystander! If you are concerned that an animal may be in distress, do not ignore it. Your actions could help save a life. In addition to protecting the animal, you may also be protecting children or adults at risk of being harmed. Recognize the signs of an animal in distress and report animal cruelty to BC SPCA’s toll-free hotline at 1-855-622-7722. * Take responsibility for the animals in your life. Animals are a part of everyone’s life. Pets, wildlife, farm animals and animals used in research can all benefit from our actions. Be a responsible animal guardian, learn about the Five Freedoms, choose SPCA Certified foods and protect wildlife. * Speak up for animals. Send a message to your local elected officials to let them know how important it is to have strong animal protection legislation as well as resources for animal cruelty law enforcement and prevention work. You can also add your voice to one of our animal welfare campaigns. * Teach the kids in your life that kindness counts. Early prevention is our best weapon in the fight against animal abuse. Summer camps, Pro-D day workshops, school presentations, teacher curriculum units and our popular Kids Club are just some of the engaging ways the BC SPCA’s youth education programs help children of all ages develop lifelong empathy skills and learn the value of compassion toward all living things. * Learn about the Violence Link. All too often, animals are not the only victims of abuse. There is a strong connection between animal cruelty and other forms of violence such as bullying and domestic abuse. Take action for animals today! 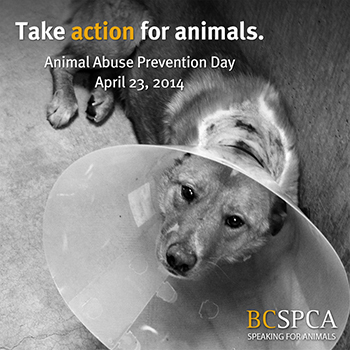 If you suspect an animal is being neglected or abused, don’t hesitate to call the BC SPCA Hotline 1-855-622-7722. They can investigate the matter and determine if there is in fact an issue and/or educate who is possibly unwittingly causing distress to an animal. In some cases, one can hope only education is required. Please do your part to speak for those that can’t speak for themselves. As a past Block Captain, there is satisfaction in everything looking green and clean in your neighbourhood. It is amazing how much garbage can be picked up with a small group of people. It is rather simple if you are the one doing the organizing. You simply go online fill out the registration form. After that, the City delivers you the requested items. Enlist a few volunteers. Designate a location that everyone in your group returns the garbage to. The City will pick up the collected garbage from that designated spot. The time commitment is what you make it, but generally 1 to 2 hours is the average. If neighbours need a little encouragement to participate, truth be told, I have enticed a few neighbours with fresh coffee and baked goodies. This event is a great way to build community and get to know your neighbours and of course everything looks so green and clean afterwards. If you would like to learn more about becoming a Block Captain, the City of Vancouver provides a Block Captain Manual which is fairly straightforward and available to download online. 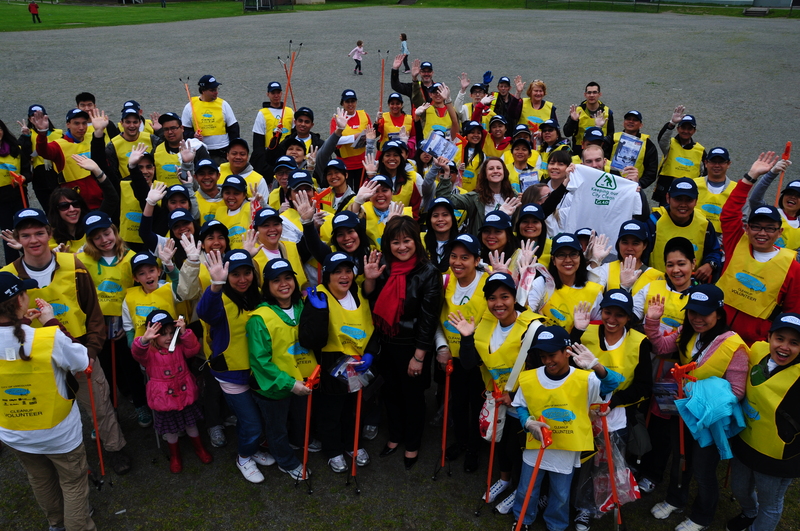 Did you know, in 2012, 16,400 volunteers in 180 groups came together to fill more than 6,000 bags with litter. Now that’s truly spectacular! C.I.A. Concerts and Live at the WISE present the Jim Jones Revue with special guest Cousin Harley this Monday April 21st at the Wise Hall, 1882 Adanac Street. You can expect a show stomping good time. Tickets are available for $20 in advance online at Brown Paper Tickets, or in person at Red Cat Records, Highlife Records or the WISE Lounge. Tickets will be available at the door for $25. You are encouraged to purchase your tickets in advance to avoid disappointment. Doors open at 7:00 pm and the show gets under way at 8:00 pm. This is a 19+ event. Hi, let me introduce myself. My name is Dorothy, I am a 9 year old female cat with tortoise shell hair and stunning olive green eyes. OK so I’m not modest. I have been hanging out at the Vancouver SPCA Shelter for a while as my previous guardians moved and left me behind. Which means I’m looking for a new home. Might you have room for me? Promise, I will give you lots of loves and cuddles, I am VERY affectionate. Psst, don’t tell the other cats or they might get jealous, but I recently had a bit of work done on my teeth, so they are pearly white now. Oh I guess I should mention, I am a bit of chunky monkey, but I prefer curvy thank you. My friends here at the SCPA say I will have to lose a few pounds, so bit of play time would help with that. So do you wanna play? I’m at the Vancouver SPCA Shelter, 1205 East 7th Avenue and would love a play date and a snuggle. If we get along, you could take me home. I’d really like that. You can me reach my friends at the Vancouver SPCA by phone at 604.879.7721, or by email at vancouver@spca.bc.ca. If you wish to share my story with your friends, so I have a better chance of finding a new forever home, I would be very grateful. Thank you. UPDATED May 4, 2014: Dorothy has found her forever home. Midtown Experiment and Broadway East Art Walk are gearing up for their next event which I might add is FREE. First up is the Barter Market which will be held at the Midtown Experiment at 585 E. Broadway. Do you have extra things to get rid of or services you’d like to offer in exchange for some goods? If so, bring the items you wish trade to this week’s Barter Market. You are welcome to bring books, clothing, seeds, seedlings, art, services or whatever else you wish to share. You are invited to come down and be a part of Vancouver’s sharing economy. The Barter Market gets under way at 6:30 pm. Next up is a free screening of the documentary People In Motion which is about Parkour. Parkour is an art that encourages people to think differently about their environment and experience it in a new way. As seats are limited for the movie, you are encouraged to bring a folding chair if you have one, or a blanket or coat, as the space can get a bit cool. The movie runs for one hour after which the Barter Market will continue until 9:30 pm. Everyone is welcome to attend this free event. You are asked to RSVP via Eventbrite.